Was this your first time participating in online dating? CAMILLE: I had done it before. I was skeptical, and really wasn’t interested in online dating. The only reason I did it was at my mother’s prompting. She read a newspaper article saying more couples that are getting married had met online. When she gave me the article when I was visiting her, I kind of rolled my eyes, but I read it and thought“ okay I’ll try it” because I wasn’t having much success meeting men of any quality or enough frequency to really meet men of substance. After I tried it, I found it very efficient far as weeding out and finding some men that are compatible with what I was looking for. I tried it 3 or 4 times over two years, and Alex was the last person I met. I always tell women — because I believe women in general are skeptical of it — but I always tell them you can’t go on it and expect to meet someone right out of the box. You have to keep trying just like with anything else. Alex: No, I went on a number of dates before, but when we met it was a good match. What are some things you wish you had known BEFORE marriage? CAMILLE: There really weren’t any surprises for me because I’ve lived with boyfriends before — twice before — which I think is very similar to marriage. Also, I’m older and have friends that are married, and most of the people in my family are divorced, so I have heard and seen a lot about relationships. So far we’ve only been married for a year so there are no surprises. Having the baby has kind of distracted us regarding the marriage itself, so I really haven’t had time to notice if there is anything bad or negative surprises. It’s been good because we’ve had the baby. In three years I may have a different answer for you (laughs). ALEX: I don’t really know because I had lived with people before. I’d been in few long term relationships. I wasn’t a rookie when we started dating and got married. So I don’t know if there were things I wasn’t aware of or hadn’t gotten a preview of. One thing about being married is that it’s more fun than I thought it would be, especially given popular image and perception of marriage being dreadful and laborious. But actually I kind of like it! Based on my own experiences — my parents’ divorce, Camille’s parents divorce and our friends who’ve gotten divorced — I never saw the point. And marriage just didn’t seem like it would be all that great, but I enjoy it. How did you know he/she was the one? Since you had already been in long time relationships. What made this one different? CAMILLE: Because we see the world through the same pair of glasses is the best way to describe it. We’re really compatible, we have the same moral outlook on life, and we balance each other out mood wise. When I’m down he’s up, and when he’s down I’m up. The timing works so the other can help when the other is down. We are not clingy or needy so that helped us to have something to talk about; we go outside of the relationship and come back with discussions. We’re not glued at the hip or anything like that. And we both enjoy the same things. ALEX: Well, I really don’t subscribe to the theory of the “one.” I think that’s a little overly romantic. I believe people evolve over time. I think I got to a point in my life where I was more open and prepared to be married. As Camille told you, she and I jibe very well, we have very similar personalities, yet complementary. We don’t seem to be down in the dumps at the same time or upset about things in the same way. So when one is down, blue, or melancholy one can pick the other up. I think we work well together. In addition, I think what contributed was my personal evolution in my job situation. I was a lawyer and very unsatisfied and when I switched to comedy it made me a happier person and made me more receptive to marriage. Have you always dated outside of your race? CAMILLE: I went to the prom with a white guy. Even though I’m from Detroit, which is mostly black, the issue of race was never a problem with my mom or my friends. Nobody ever said, “Why are you dating that white guy?” I didn’t exclusively date white guys but I’ve dated Hispanic guys, Black guys, and white guys, it doesn’t matter. I don’t see color. It’s not like I have a specific taste. ALEX: I have dated black women, Latina women, and an Asian woman. I met people who just happened to be different from me that I was attracted to. Personality wise we were compatible I have always dated “drama” free women and for whatever reason those relationships ended. Do you think you were like that because your community made it comfortable for you to date outside your race? Or did it matter? CAMILLE: That’s a good question. I think my community has the most important part to do with it. Also, most of my friends are of other races whether they’re white, Korean, Hispanic, so maybe I would’ve done it anyway. I’m not sure. ALEX: I think it would be, but I can’t imagine it [family being upset about dating outside one’s race] in my family. I know that my siblings and parents are open-minded socially and politically. I know that Camille’s family is the same. For others who have family members who aren’t supportive it is challenging, but what I encourage people to do is follow your own heart even if that means family members will be upset or missed. Just live your own life. What’s the greatest thing you’ve learned from your spouse? CAMILLE: We had a non-traditional approach to getting married. We said, “that’s so traditional and boring. What do you need a piece of paper for?” I was really surprised when Alex wanted to get married. But, he wanted to make it official because of the baby because he didn’t want his child to have to explain, “why are your parents not married?” I said, “that’s ridiculous we don’t have to get married because of that,” (giggles) but it’s nice. I feel like Alex has risen to the occasion not to be just a good father but a really great husband. It’s really just been great! He’s just that type of person that when he makes up his mind to do something he does it. When I first met him he was really opposed to marriage but all about being in a relationship and just to see him as this dedicated father and husband is just great. I think a lot of men will do that, they will rise to the occasion if given the opportunity or once they make the decision to take on the role. ALEX: She is very even-tempered and very good at not getting ruffled. I’ve challenged myself to be better at those things to stay calm and take a look at the bigger picture. Stay centered. She’s really good at that, especially when I don’t take out the garbage. (LOL). She has encouraged me to be like that and at the end of the day her encouragement has been correct and very helpful. How was it telling your inner circle that Camille was pregnant? Will you have another child? ALEX: There wasn’t an issue and given the fact of our respective ages, our families just were overjoyed that they were going to have an addition to the family. Any other factors were completely ignored. Our families are very open-minded about diversity and dating. What about the N-Word and interracial families? ALEX: Race never comes up in our families unless it’s like a joking thing. But I’m pretty aware of race issues and dynamics in the world. 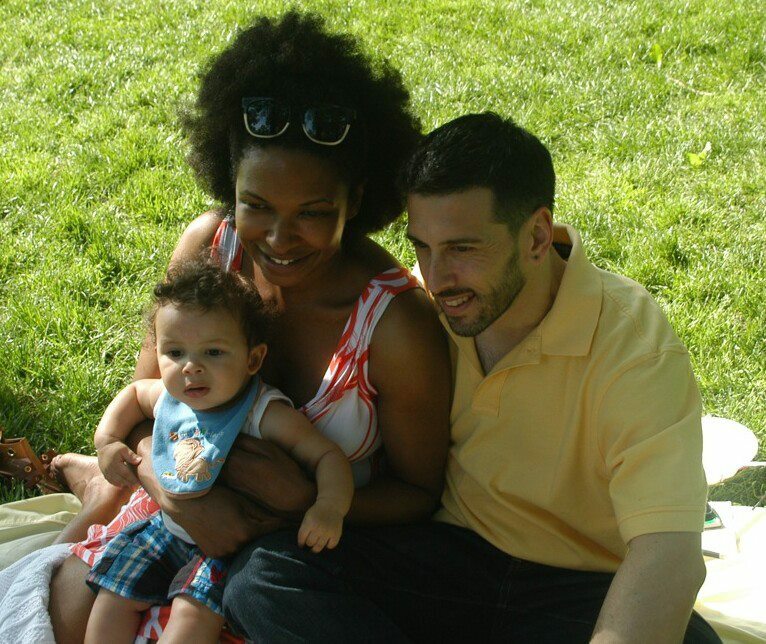 I’m a Jewish man and my son is going to grow up believing he is… I don’t know what he’s going to believe if he’s biracial or black. A lot of the people in the world will view him as black. Black men in America historically have a difficult row to hoe often. I’m certain there will be times he will confront situations as a Black man in America that I’ve never had to deal with. He may not get a cab, someone may follow him in a store, someone may think he got into school because of affirmative action instead of his own merits, someone may call him the N-word, and someone may make remarks about slavery. These are things I’ve thought about. I don’t have a good answer for them. I think it’ll be fact specific at the time. I’ve thought about it before we got married, before Ivan was born, and now. That’s why I deal with it on stage. I deal with it in a funny manner because comedy is a way we deal with life’s issues, tragedies, and social commentaries. What most people like on this site!